Biological soil crusts (biocrusts) are critical components of arid and semi-arid ecosystems that contribute significantly to carbon (C) and nitrogen (N) fixation, water retention, soil stability, and seedling recruitment. While dry-land ecosystems face a number of environmental changes, our understanding of how biocrusts may respond to such perturbation remains notably poor. 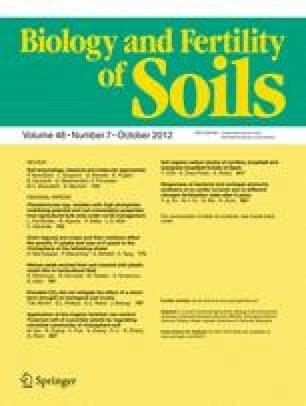 To determine the effect that elevated CO2 may have on biocrust composition, cover, and function, we measured percent soil surface cover, effective quantum yield, and pigment concentrations of naturally occurring biocrusts growing in ambient and elevated CO2 at the desert study site in Nevada, USA, from spring 2005 through spring 2007. During the experiment, a year-long drought allowed us to explore the interacting effects that elevated CO2 and water availability may have on biocrust cover and function. We found that, regardless of CO2 treatment, precipitation was the major regulator of biocrust cover. Drought reduced moss and lichen cover to near-zero in both ambient and elevated CO2 plots, suggesting that elevated CO2 did not alleviate water stress or increase C fixation to levels sufficient to mitigate drought-induced reduction in cover. In line with this result, lichen quantum yield and soil cyanobacteria pigment concentrations appeared more strongly dependent upon recent precipitation than CO2 treatment, although we did find evidence that, when hydrated, elevated CO2 increased lichen C fixation potential. Thus, an increase in atmospheric CO2 may only benefit biocrusts if overall climate patterns shift to create a wetter soil environment. We would like to thank Mandy Turner for her field leadership and hard work. Additionally, we would like to thank Melody Bourret, Matt van Scoyoc, Adam Collins, and Tonya Troxler for their assistance gathering data in the field. We would like to thank Drs. Erika Geiger, Matt Bowker, and Ferran Garcia-Pichel for assistance in editing. This work was funded by the U.S. Geological Survey Ecosystems Program. Any use of trade, product, or firm names is for descriptive purposes only and does not imply endorsement by the U.S. Government.